We are currently spending Monday to Friday in Sydney primarily for work purposes, but that doesn't mean we don't want to enjoy some of the finer things Sydney has to offer. Most of our commitments for the week are at the International Conference Centre Sydney, so that certainly narrows the field a little when it comes to accommodation options. If you haven't been, the conference centre is huge! So you will be doing a lot of walking even while remaining in the centre throughout the day. And so for us, that means we want to be staying nice and close when the day finally comes to an end. Not to mention, staying somewhere with convenient access means you can take your time over breakfast in the morning, you can pop back to the hotel when a session doesn't interest you, and of course easy access to the Hotel's afternoon canapés (if you are lucky enough for them to be on offer). All that meant that in our view, the Sofitel Sydney Darling Harbour was the obvious choice. The Sofitel Sydney Darling Harbour is a recent addition to the Sydney skyline having opened in the second half of 2017, and it certainly still has that “new hotel” feeling. We understand it was actually the first five-star hotel to be built in Sydney since the Olympics oh so many years ago, and from our experience it was worth the wait. The hotel is 35 floors of modern comfort, with just under 600 rooms. Quite a bit bigger than what we normally seek out in an accommodation option, but given the purpose of this trip, and the convenience we were seeking, an exception was made. And to be honest, we experienced very little evidence of the size with all aspects of our stay being smooth and with prompt, friendly, personalised service. Our room was modest in size but stylish and very comfortable. The floor to ceiling windows running the width of the room provided rewarding near 180 degree views including of Darling Harbour itself. As indicated, one of the biggest draw-cards for the hotel is its location. 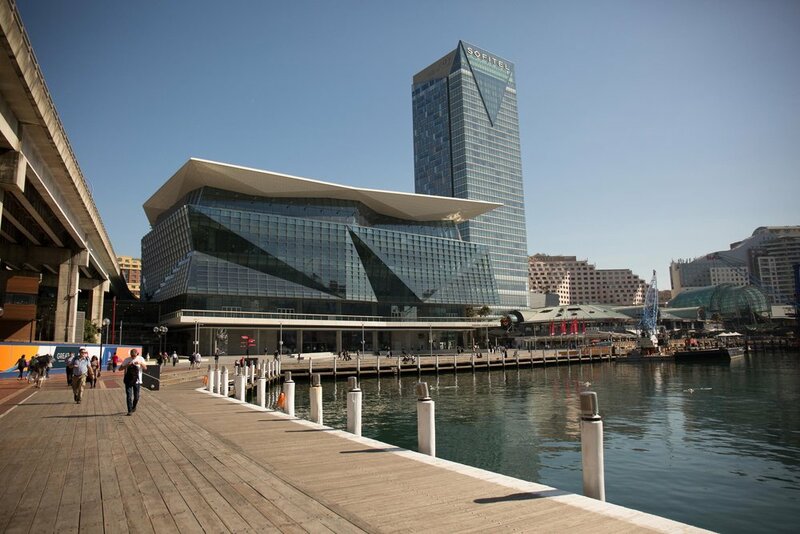 Firstly for the convention centre, then of course all Darling Harbour has to offer. As a bonus it is still only a short walk across the Pyrmont Bridge to the city including plenty of, dangerously convenient, shopping options. 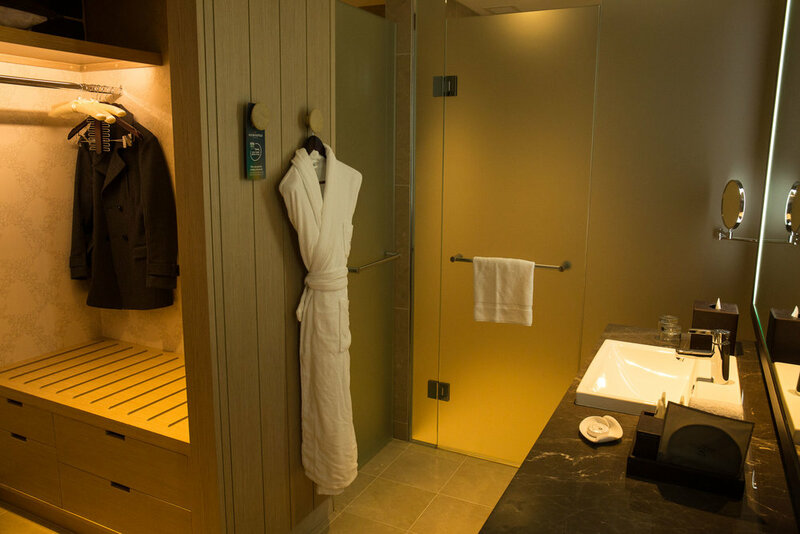 As you would expect there is a range of rooms to choose from, but for us we were really only interested in the Club Millesime rooms (Luxury and Superior), which as the name suggests includes access to the exclusive club on the 35th floor. There you can enjoy breakfast, including cooked elements, snacks and non-alcoholic drinks throughout the day, afternoon tea and of course hot canapes and liquor in the evenings. The Club has 200 plus degree views over Darling Harbour and over Sydney city, there is even a hint of a view of “the Bridge”. It is a very comfortable space to relax, but we found it most advantageous for working. It only became busy on the Friday morning, and the staff were very friendly and very helpful ensuring a continuous supply of flat whites and moreish cookies. Aside from the club, the hotel has a well-reviewed restaurant Atelier, a French inspired grill. There are also three bar options including one by the inviting infinity pool on the fourth floor. However, to be honest, with so many amazing dining, and imbibing, options in this great city, we didn’t hang around after the included pre-dinner drinks in the club, and instead sought out sustenance further afield. Mmm, where to start … we would have to say … dinner at Momofuku Seiobo was the highlight of our entire trip to New South Wales! Being joined by great company always helps (thanks Mitch) but very clearly, we highly recommend you also make a booking next time you are in town even if you are on your own. And yes, you will want the Chef’s selected degustation and you absolutely must have the matched beverages (they are not just wines). In fact, the beverage matching is one of the most interesting we have ever experienced. This is no ordinary degustation. There is no menu provided, adding to the intrigue as each dish arrives at your table with a detailed explanation by your attending staff member. This kicks off with four ‘snacks’ each with a paired beverage laid out as a flight. You are told what you are eating, but not what you are drinking. Instead a little game ensues whereby you are asked to guess before you may learn the truth. In this regard, we started off well, but became increasingly wide of the mark as the eclectic selection took us to places we had never been before. The 10 courses are inspired by the flavours of the Caribbean, prepared from the best available local produce. And executive chef Paul Carmichael his team really kicking arse and taking no prisoners. A little surprisingly, the sea urchin was probably D’s favourite, contained within two flavoursome crisps that perfectly offset the texture of the main element. Unfortunately A was enjoying herself a little too much on the even, yes including the eclectic matching drinks’s, so she is unable to help much on when it comes to her favourites. All she can really add is … next time we are in Sydney, we are going back!!! Regarding the drinks, to be frank, there were more than a couple of the beverages over the course of the evening that on first taste, prior to trying the matched dish, we thought we would never wish to taste again. However the pairings where so perfectly implemented, the result was always far greater than the sum of the individual components. We should never have doubted. One important warning … a signature dish, for very good reason, is their marron (freshwater crayfish) from Pemberton, Western Australia (being from WA ourselves we have of course enjoyed many of these local delicacies and this was amongst the very best). However, the animals are brought to your table, alive, for inspection before preparation in traditional fashion. Obviously, this helps evidence the freshness, not that you would have any doubts once you take that first bite, but we know all too well some diners will not be big fans of the practice. We commented at the time that we were very glad A’s sister, Jenna, did not join us on this particular occasion, such an experience would not have been received well by this devout vegetarian! Secure your table at https://seiobo.momofuku.com/. There is plenty of buzz about Ester and rightfully so. Taking out second place in the Australian Top 100 Restaurants as presented by the Australian Financial Review was probably a slight disappointment after Chef Mat Lindsay was voted the Gourmet Traveller Chef of the Year. But given all the accolades we just had to check it out for ourselves. And we were definitely not disappointed. To say the facade and entrance is understated is … an understatement, but luckily the same can’t be said for the flavours. Inside the space is small and cosy, so don’t expect to be stretching out in your seat. But when in a big city like Sydney, dining in close proximity to your fellow food lovers is not unexpected and need not distract from the main reason you are here. The food is all about full, strong flavours, heavy meat dishes and punchy accompanying juices and sauces. It is not for the faint of heart nor those looking for something light and unobtrusive. Though funnily enough, he had no time for the bone marrow which for us was the clear highlight of the evening. Having said that, our charred prawns and the grilled lamb intercostal would both easily take centre stage on any other night. For our dessert (which we definitely didn’t need) we shared the "Three Milks”. Subsequent research reveals it is a combination of goat milk dulce-de-leche (caramel), a super light sheeps milk yoghurt and pannacotta. While the website suggests it holds seats for walk-ins, we would recommend not risking it and instead booking early to avoid disappointment. The Surrey Hills venue was the first of now three locations (including Melbourne and Tokyo) for the Longrain empire. The food is contemporary Thai, and the atmosphere is relaxed and unpretentious. The filled eggnet was the clear winner on the night. We shared several other dishes with our guests on the night. But if we are being honest, after a big week of dining out, we were beaten before we really started. A lesson in moderation if ever there was one. So we will reserve further comment for next time when we can truly give the cuisine a chance. One thing we didn’t mention regarding the Sofitel Darling Harbour Hotel above, is that it does not have a Spa. We don’t think you can hold that against it, but D was hoping for a little relaxation time and so after getting over the initial disappointment, he set about finding the best spa in Sydney. 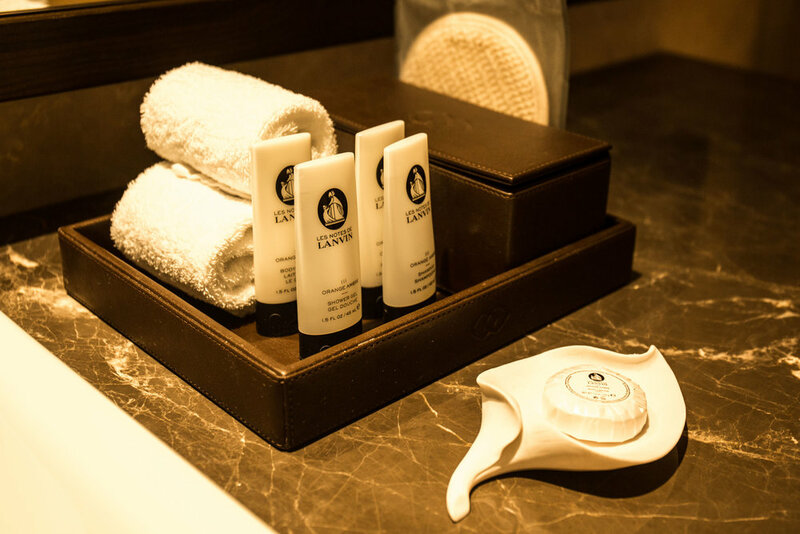 The Darling Spa is located at The Darling Hotel in the Star Casino complex, and based on some in-depth research, it seemed like one of maybe two or three contenders for the crown of Sydney's best. It was less than a 10 minute walk from the Sofitel to The Darling and the Spa is located on Level 2. After a small glitch booking in (things happen, it wasn’t the end of the world) a 90 minute aromatherapy massage appointment was secured. The spa is opulent and luxurious, dark and calming, and once inside you are a world away from the bustle of Australia’s biggest city. The mens change rooms continued the theme with luxurious facilities including showers and all necessary (and some less so) amenities including deodorant, La Prairie moisturiser and more. Initially you start to unwind in a sitting area, The Tea Room, where you can enjoy fine ginger tea and snacks of banana chips, nuts and dried fruit. Your therapist then collects you and takes you to your treatment room. D’s massage was perfect, the therapists touch was never broken from beginning to end. The requested pressure level on this occasion was medium, given the visit was all about achieving overall relaxation and calmness rather than the usual knot removal, and this request was followed perfectly. Though the great thing was it didn’t mean that when a particularly tight area was located it missed out on the requisite attention in order to achieve a release. There is a steam room, jacuzzi and hamman. All of which you can enjoy throughout the day of your treatment. D chose to spend some time in the jacuzzi after his treatment. From there it was to the Zen Lounge room with several lounge chairs, allowing for a rest (even a sleep) after your treatment if you so desire. To learn more and to book visit The Darling Spa.